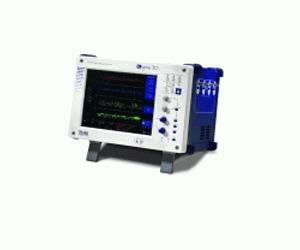 The Sigma 100 is the top of the line Sigma model incorporating 100 MS/s 12-bit digitizers on every channel with 25 MHz bandwidth and 1 MegaWord of memory standard. Setting new performance standards, the Sigma series integrates high accuracy signal acquisition, extensive analysis capabilities and a full featured Windows™ PC in an affordable compact family of products. All Sigma models have a 10.4" SVGA color touch-screen display, sophisticated array of real-time measurements, 100 baseT, PCI expansion slot, USB, SVGA output, PC audio in/out, mic in, RS-423 and parallel interfaces in an integrated Windows PC. Sigma series scopes have a standard active IntelliProbe interfaces which seamlessly integrates probe ID, scaling and probe power. Optional Synchroscope® Module which enables rotational measurements and independent dual monitor mode make a Sigma series scope a versatile choice. Up to 0.25% accuracy at probe tip - the best available at any price! Direct support for a wide range of third party analysis packages - even running on the Sigma!